Sign up to a free fax number for Yahoo! Q: Where do I sign up for a free fax to email number for Yahoo? Q: How long does it take before I can receive faxes for Yahoo? A: You can start using the free fax to email service right away, it will take you seconds to sign up. All we need is your name, phone number and email address, is is that easy! What you need before you start : Your yahoo email address - to receive your faxes. If you do not have a yahoo email, then you will need to sign up for an account. 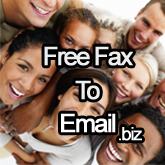 What you would like to get: Your own personal free fax number! You will now receive your very first free test fax automatically. If you fail to see the fax in your messages, click "Spam" and look for the email in there. Click the email to view it and click "NOT SPAM "
Click "MOVE" and select "INBOX"